Most youth workers will admit that they don't spend a lot of time thinking about safety in their youth ministry. Sure, they shout, “Seat belts! ” when the crew loads into the van, or they use the buddy system when at theme parks. But beyond that, they're mostly concerned with introducing students to Jesus. Nothing's wrong with looking after their spiritual well-being, but overlooking their safety can lead to pain and problems for you, your students, your church, or your community. The reality is, whether it's a game of dodgeball in the church gym, or a rock climbing trip during a summer retreat, you have precious cargo in your care, and it's your responsibility to make sure they return home safely and in one piece. 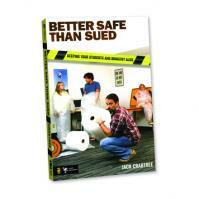 Better Safe Than Sued is an essential guidebook for anyone in youth ministry—paid or volunteer, veteran or rookie.